Deported filmmaker James Ricketson told media on his return to Australia that he still loved Cambodia and wished to return, despite just being given a royal pardon from a six-year prison sentence. More than 560 policemen have been deployed to protect detained opposition leader Kem Sokha – a move defended as necessary to deter “social chaos” but denounced by critics as painting Cambodia as unsafe. The Japanese and Cambodian governments have allocated $1.5 million to fund phase five of the Bayon temple restoration project, a Unesco official said on Tuesday. The Asian Development Bank (ADB) forecast Cambodia’s gross domestic product (GDP) growth to maintain its strong momentum in 2018 with strong performances expected in exports and domestic demand, said its press release on Wednesday. In 2012, Navin Muruga quit his corporate job at a global recruitment firm in KL and volunteered in Sri Lanka and Kenya. Family-based chicken farming is on the rise in Cambodia, thanks in part to a $1.35 million project funded by the EU, said an NGO, People in Need Cambodia (Pin). A senior land management ministry official has warned that officials will take action against land dealers who sell unregistered plots amid a market boom. Interior Minister Sar Kheng is pushing for an amendment of the forestry law to be done before the end of the current mandate. Police in Phnom Penh’s Por Senchey district are looking to arrest suspects involved in a $30,000-heist in Chaom Chao II commune on Monday. More than a hundred workers who demanded additional financial benefits from the Apsara Authority before they resume restoration of the West Mebon temple in Siem Reap province have threatened to protest at the French embassy in the capital. Samdech Akka Moha Sena Padei Techo Hun Sen, Prime Minister of the Kingdom of Cambodia, held bilateral talks with H.E. Lee Nak-yeon, Prime Minister of the Republic of Korea, in Hanoi, Vietnam this afternoon, after paying homage to the late Vietnamese President H.E.Tran Dai Quang. Ministry of Labour and Vocational Training hosted here yesterday afternoon the 3rd Steering Committee Meeting of United Nations Joint Programme on United for Youth Employment in Cambodia. The government is partnering with a Chinese company to create the first private online school in the Kingdom to make it easier for students to learn new skills. Prime Minister Hun Sen yesterday paid tribute to the late Vietnamese President Tran Dai Quang who passed away last week at a military hospital in Hanoi. City Hall has denied a request made by the Cambodia Independent Teachers Association to rally on World Teacher’s Day at Wat Phnom on October 5. Former opposition official Meach Sovannara is publishing a book detailing his experience behind bars as a prisoner in Prey Sar prison. A group of leading US firms invited by the US Embassy is now in Phnom Penh exploring investment opportunities in Cambodia’s agriculture sector. 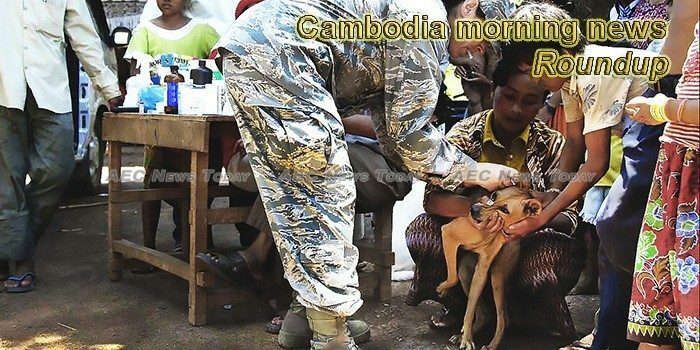 This week’s Cambodia morning news feature photo acknowledges World Rabies Day, September 28.